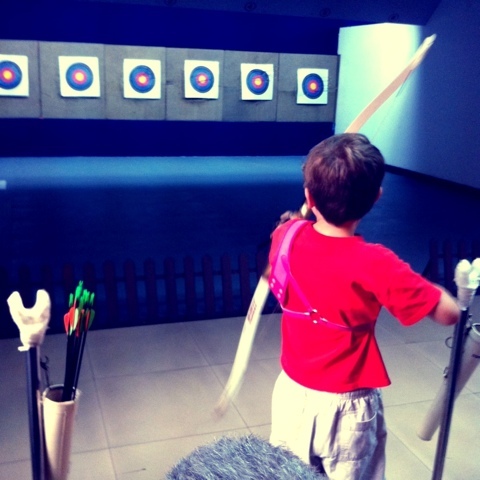 Michael took the boys to a local archery range right around the corner from our house. Twelve arrows for around a buck. I stayed home and did laundry. And by laundry, I mean I took advantage of having the house to myself and blasted Walking the Dog by Fun. twenty times in a row while dancing my way to and from the laundry room. Which is the best way to do laundry, especially when your washing machine capacity is equal to exactly one outfit and should you take two days off from doing laundry for a family of four you will never, ever catch up again. Unless you blast a lot of music from Fun. Nah, never mind, you won't catch up no matter how upbeat the music, but at least it lightens your mood. Michael reported back that the boys really enjoyed themselves. Nathan had great form until it was time to let go and then he became a wet noodle. 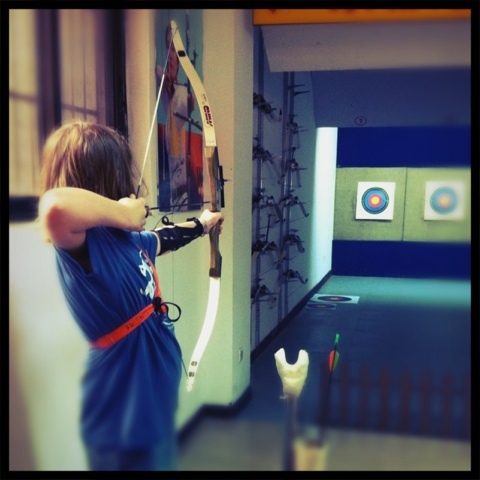 Ben had two modes, he either hit the bullseye or missed the wall completely. I'm sure they'll get more practice. A buck for an hour of fun for them and an hour of Fun. for me? Gold medal experiences all around!